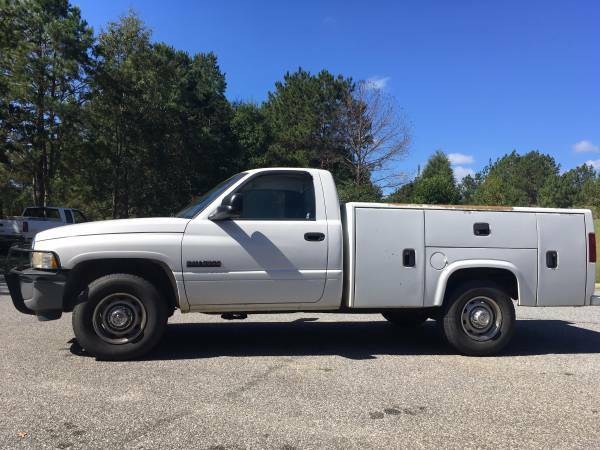 For sale is a 2001 Dodge 2500 with Cummins diesel and Knapheide KSS 8’ long, 6 box service body. 225K Miles. Bought new and used as a service truck for our business. THE GOOD: Serviced regularly by local diesel mechanic. All oil leaks fixed, new turbo, doesn’t smoke, and has cold A/C. Runs great and pulls strong. Brakes and tires good. THE BAD: Drivers seat worn from getting in and out, dash cracked, passenger mirror glass broken, paint on service body worn. Vehicle can be seen 8-5 CST by appointment. Contact Ed.